In 1860, Édouard-Léon Scott de Martinville was a typesetter (and possibly a bookseller) in Paris. He also liked to tinker, which lead him down the path of making the world’s first audio recording, using his printing tools and knowledge. Printing and imprinting is something Scott understood very well. Capturing the song in 10 second visually-printed snippets must not have been too difficult, once he figured it out. The problem was he didn’t know how to play back what he’d recorded! He printed all of the “grooves”, using his phonautograph on rag paper, but no phonautograph-reader has been found. So modern-day scientists had to cook up a way to sight-read the recordings, to what I think are pretty nifty (and spooky) sounding results. This scenario doesn’t sound too different from today as people in the music, movie, book, web and mobile fields are crossing lines, mashing up tools and pushing boundaries to make new books and products. 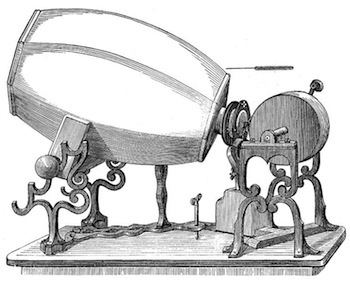 I just think it’s neat that the first audio recording ever made was actually printed on paper.